Within a few hours of each other, two similar emails have arrived in my inbox demanding some attention. First was this week's Mahubah's Corner article from Avalyn Hunter. Topic: Passion for Gold, the recent Medaglia d'Oro stakes winner and only the second colt to score a black type victory for a sire whose fillies have been his standardbearers. Second was ... well ... an article on Passion for Gold. The, uh, recent Medaglia d'Oro stakes winner. And -- stop me if you've heard this -- only his second colt to score a black type victory. This email came from Alan Porter, who wears the Porter on Pedigrees cap while writing for BloodHorse.com, and his Pedigree Consultants hat for TrueNicks.com. One French group winner, two stories. That's a lot of Passion. It's also a fun opportunity to see what caught the attention of two of the industry's top pedigree analysts. Avalyn comments on Passion for Gold's descent from the historic Crepuscule female family; how Medaglia d'Oro's Northern Dancer-line pedigree crosses with mares from the ubiquitous Mr. Prospector ilk; and how distance and track surface will play a role in the colt's future racing career. Enjoy her Mahubah's Corner column here: Medaglia d'Oro Has a Passion for Gold. 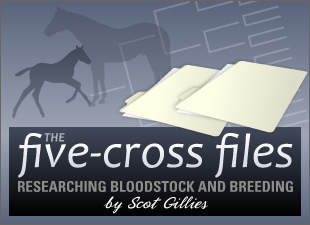 Alan focuses on the ongoing emergence of Sadler's Wells as a distinct sire line; Medaglia d'Oro's turf qualifications; and inbreeding patterns in the mares that produce top Medaglia d'Oro foals. Read his TrueNicks post here: Some Gold For the Colts.